It is our privilege and honor to journey with you on your path of discernment. Please fill out the request for more information and we will be happy to send you a general information packet and to be in contact with you. May God bless you and keep you on this journey of faith called Life! "The past is prologue. God is calling us to somewhere new, a place we do not yet recognize." In the distance I could hear the sound of church bells echoing throughout town. This was our sign to start the short walk down the street to Sunday Mass at St. Charles Church in my hometown of San Carlos, Arizona. At times, even now I can still hear my grandfather's voice, "Come on, let's get going." It was a short walk, but one that would have a lasting and profound effect on my life. On our Sunday morning walks to gather with the Apache Catholic community, my grandfather would always ask me one question: "How are you doing?" He said it with real concern, and not as a way to make small talk. I would share my struggles and some of the joys I was experiencing in my young, sometimes chaotic life. 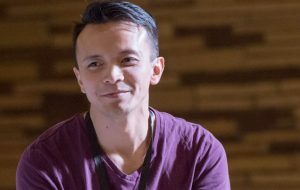 He would share his stories of hardships he experienced growing up in a similar situation. No matter what, he would always remind me how much he loved me. And I always knew it, not by his words, but by his concern and care. This short journey I shared with my grandfather shaped me into the person I am today. It was on this journey that I experienced the meaning of God and what God's love is really about. Now I wish to journey with others, as my grandfather once journeyed with me, so that they, too, might have an encounter with the love of God. 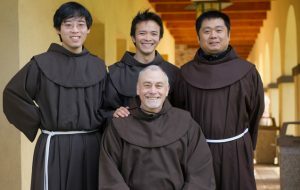 I am currently living and working at St. Francis Retreat in San Juan Bautista, California, as part of my continuing formation as a Franciscan friar. 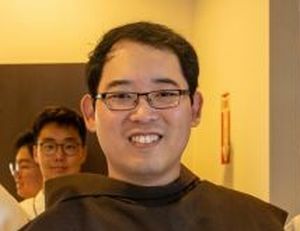 The way in which our vocation is lived out takes on a variety of forms. 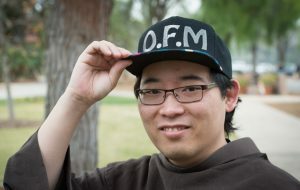 Some of us are called specifically to religious life as a brother, sister, or priest. Some are called to diocesan priesthood or the deaconate. Others are called to marriage, and still others are called to life as a single man or woman. Each call is an expression of our shared vocation expressed above in the passage from the Gospel of Luke. 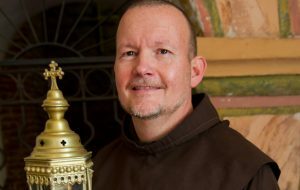 Thank you for requesting more information on the Franciscan Friars of the Province of Saint Barbara. We are happy to send you general information on our Province, and will follow up with additional information on our community, prayer, and ministerial life.